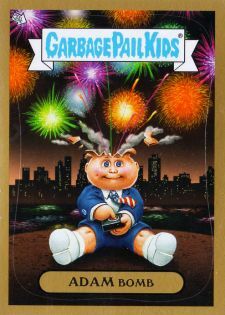 The classic cards from the 1980s are back with Garbage Pail Kids Flashback Series 3. Largely recycling images from the first 15 series with new borders, the Flashback cards do offer a handful of updated GPKs with the "Where Are They Now?" 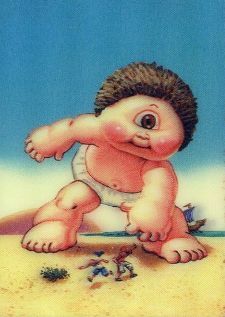 subset and some new images in the "Lost GPK" subset. 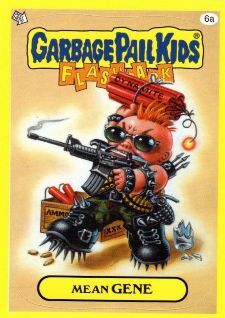 Collectors can also look for several parallels, Adam Bomb tributes, 3D cards, sketch cards and autographs from original GPK artist, John Pound. 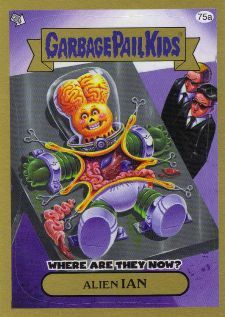 160-card base set (traditional two names for each image) based on classic Garbage Pail Kid characters from the brand's original run. Subsets include updated Where Are They Now? cards and Lost GPKs. 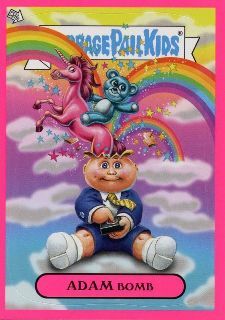 Autographs from original GPK artist John Pound. 3-D Cards (5 cards) bring back the likes of Adam Boom and Sy Clops with modern three-dimensional printing technology. 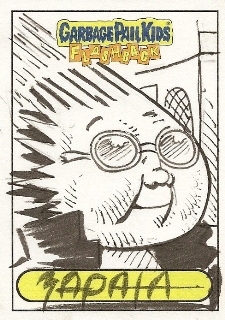 Adam Mania (10 cards) celebrates the iconic face of GPK, Adam Bomb in new settings. Also available in Green, Pink, Silver and Gold parallels.